Delightfully ghoulish and dripping with in-your-face macabre style, "the Gauntlet Master" bracelet is perfect for bikers, goths, rock stars (both legitimate and wannabes) and anyone whose fashion sense leans toward the dark side. The bracelet's centerpiece is a human skull, donning a nefarious, toothy grin and creepy eye socket chains - a sort of sinister postmortem piercing, perhaps? Actual miniature chains are used in the distinct motif, but this is just one of many examples of this piece's extraordinary attention to detail. 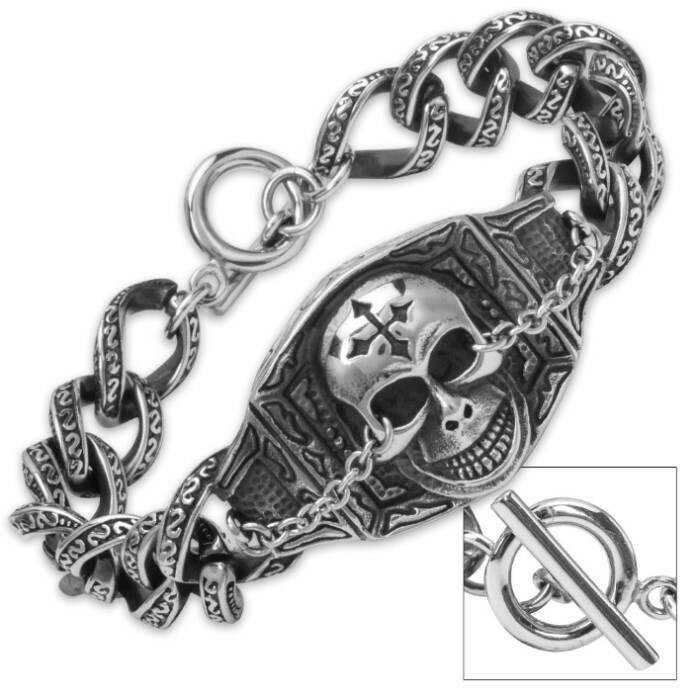 A cross is carefully embossed onto the skull's forehead, and delicate relief patterns and textures cover the frame behind the skull and every link in the chic chain. Easily secure and remove the bracelet with a quick twist of the toggle clasp. "The Gauntlet Master" looks equally amazing on men and women and pairs well with practically any outfit. Its high quality stainless steel construction boasts a sheen, corrosion resistance and durability that simply can't be matched by traditional, more expensive jewelry materials. Precious metals like silver and gold tarnish and fade, and even advanced modern ceramics are prone to chipping. But the Gauntlet Master Bracelet is truly forged for a lifetime of vigorous wear, so you needn’t fear damage while performing carpentry, vehicle repair/maintenance and other hands-on work. At 8 1/2" long, one size fits most. 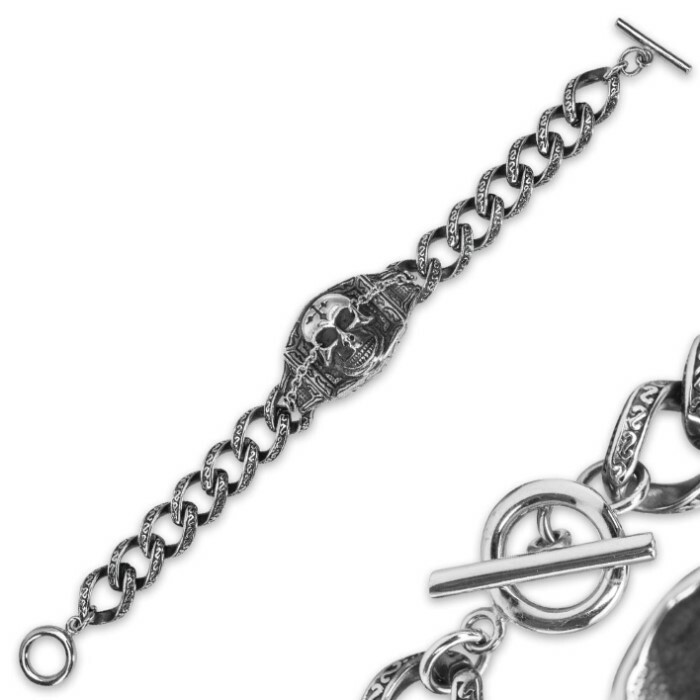 The Gauntlet Master Stainless Steel Chain Bracelet makes a fantastic, memorable gift, and you won’t find better prices on fine jewelry like this anywhere else!